I’ve heard arguments on both sides of this topic. In the past I thought that it was a waste of marketing dollars to spend it on consumables until our company received a beautiful food basket. It was unexpected and very much appreciated! We’ve never forgotten it. We also received a box of cookies from another vendor. The lasting impression that it leaves stays with you longer than you would think. If you pair your food gift with a hard promo item like drinkware or a tote bag decorated with a subtle logo, your promotion or brand hangs around much longer. Food gifts leave a sense of well-being and induces happiness within the workplace. Now the entire company can enjoy your gift. Every time you see the drinkware or tote, you’re reminded of the kindness of the giver. Also, think of the sense’s that food gifts appeal to: taste, touch, sight, smell. The more sense’s you appeal to, the longer the memory will last. It can also bring back some childhood memories. Remember when your Aunt would come to visit with a pocket full of sweets? You couldn’t wait for her next visit! Expensive? Not necessarily. When you think of food gifts, think of the lasting memory and impression it leaves. That’s what you must factor in when planning your budget. How would you feel if tomorrow you came into work and a beautiful food basket was waiting for you? They’re not just for holiday time. It’s best when unexpected. Now you’ve left them with the shock or surprise value. You’ve just added another dimension to the promotion. 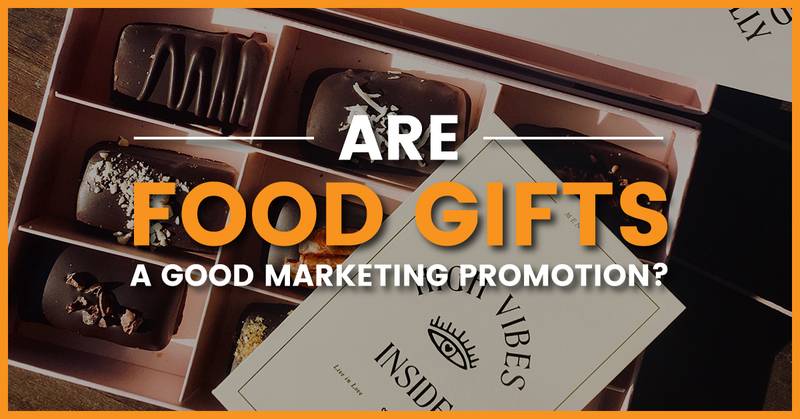 So, I recommend using food gifts as part of your marketing plan. You’ll always be remembered. Rita has been in marketing since 2004 and a promotional product specialist for over 11 years. She strives to be the go-to person for her clients’ tradeshows, holidays, and events throughout the year.